There's this art store in Singapore called Overjoyed that stocks most of Strathmore's paper. 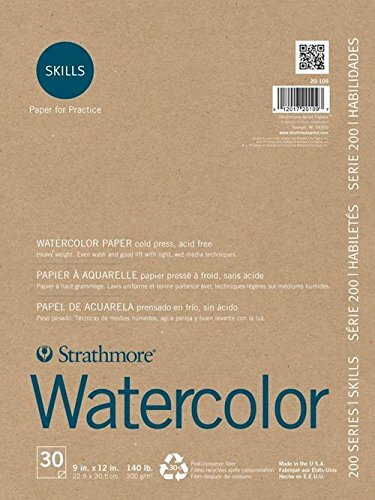 Few days ago, I spotted the Strathmore 200 Series Watercolor Paper. I don't think I've seen that before. So I decided to buy it to try it out. 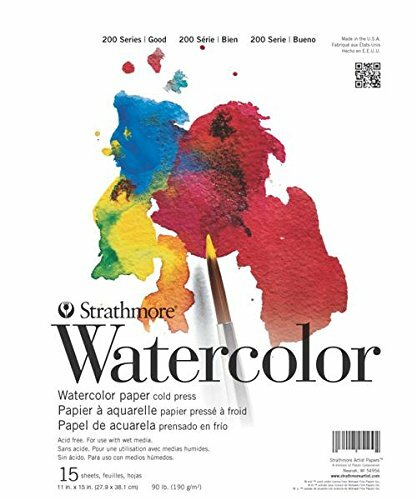 Strathmore categorises their paper into different series, from 100 to 500 (best quality). So the 200 Series paper is basically student grade paper. There are 30 sheets in this pad. The paper weight is 300gsm so they are quite thick. The texture is coldpress but on observation, they look more like fine grain surface. The Skills Series paper has 30% post-consumer fiber (recycled paper) and the paperweight is 300gsm. The normal 200 Series paper is 190gsm and no mention of the composite (most likely cellulose). My first impression when I handled the paper is, it's not as bright/white compared to the Daler Rowney Aquafine watercolour paper (student grade) that I usually use for practice. Secondly, the coldpress texture is smoother, like fine grain. The paper's able to handle wet on wet techniques well enough. When you use lots of water on it, the paper would buckle slightly. It's 300gsm so it's quite thick and does not buckle that much. The paper absorbs water a bit more easily compared to watercolour paper that's properly sized. So if you want to practice wet on wet techniques, you need to work fast. Pen and ink works wonderfully on the paper. Lines have sharp edges and do not feather. I like to use watercolour paper for mixed media art as well. Coloured pencils work fine. The fine grain has some tooth to it. So the paper white will still show through. You can press down the pencil harder to fill in the tooth. So here's how it handles graphite pencils. This was drawn with Sharpie markers and Copic markers. The markers did not bleed through nor feather. With watercolour, it seems that the colours are slightly dulled down. This is especially so when compared to whiter paper. I think it's got to do with the shade of the paper. It's not bright white. I can't say that's off-white too though. It's difficult to describe. But colours have a more subtle look on it. Since the paper texture is fine grain, granulation textures are not going to be obvious. I used French Ultramarine for the blue and the granulation is not obvious. By the way, the ink I used here is the De Atramentis Document Ink (brown). Because the paper texture is fine, it's not that great for layering too. Glazing with 2 or 3 layers should be fine. I think at the third layer, the paint does not apply easily, and also the colours start to get duller. Overall as practice paper, I guess it's alright. It's really affordable. The retail price for this at Overjoyed was SGD$12.90. And then there's a 10% discount. So the final price is around USD $8.30 equivalent. That's quite a good deal for 30 sheets. The quality is definitely not the best but that's to be expected with this sort of budget pricing. As mixed media paper, I think it's alright, just don't expect it to work miracles, like giving you that extra vibrancy or handling layers upon layers of glazes. Pen and ink with watercolour style works fine. I won't use this paper to demo watercolour techniques, but I have no problem using it to demo sketching techniques with pen and ink with watercolour. Daler Rowney Aquafine watercolour paper is still my preferred choice. That's made in UK so it might not be easy to find depending on where you are and the distributor. Strathmore is made in USA so I guess it should be easier to find in USA. Here in Singapore, we can get both easily. I have a new found appreciation of watercolour because of your blog. Your drawings are excellent! And you reviews are great and informative. Thanks. You mention the Daler Rowney Aquafine watercolour paper is good value for money for beginners, do you have a review on this paper. I looked at your drawings and the paper looks rough rather than smooth. Are there any other you would recommend that comes in packs with 50 sheets and above for beginners as practice paper. I'm struggling to find some here that are affordable in Australia. All our prices are like 3 times the amount on Amazon and unfortunately not many ship here without expensive shipping.